This is a first... I just went to 7-Eleven and noticed a sign that said 49¢ medium Slurpees this weekend. That's the first time I saw something in person that I wanted to post (sorry that I didn't see it earlier as this has been going on since Friday). So head over to your local 'Sevie' and get a cold one for a fraction of the price. I know I will. I recall living in Boston and having to take two trains to get to the only one in town. That's how good they are. 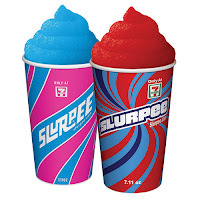 Click here if you want proof they are offering this slurpee sale at 7-Eleven, or just head over to your local store.